Today, is the last day of the December Release for JustRite Papercraft and I have one more stamp set to share with you. 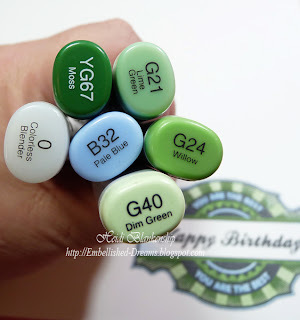 Here is the CL-03980 Vintage Pearl Labels stamp set. This set includes two beautiful labels, one accent and eight sentiments. The CL-03980 Vintage Pearl Labels stamp set is a perfect match to the JB-03730 Vintage Label & Banner Dies from the JustRite Papercraft Custom Dies. 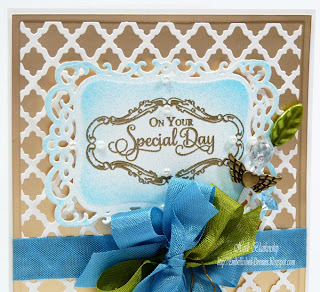 Here is the card that I designed using the new stamp set and matching die templates. I stamped the label on to Simply Smooth White paper with Tuxedo Black and colored with Copic markers. 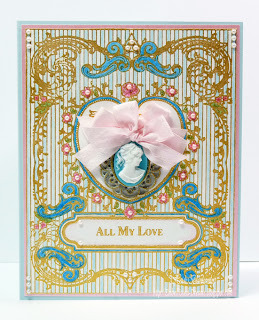 The pattern paper is Romance Novel 6 x 6 paper pad from Prima. I added some ivory pearls around the label to frame the sentiment. Then I added 5/8'' Black Crochet Lace Trim and Black Seam Binding from Really Reasonable Ribbon and a couple of stick pins. Thank you so much for stopping by today! Please be sure to visit all of the Designers in the link list below to see what they have to share with you. Welcome back to Day Three of the JustRite Papercraft December New Releases. Today, I have to stamp sets to share with you. 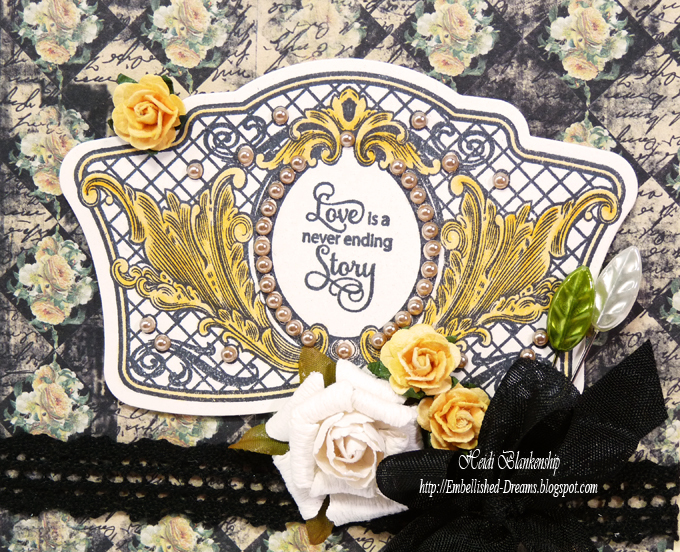 The first stamp set is this beautiful CR-04325 Antique Valentine Tags One. 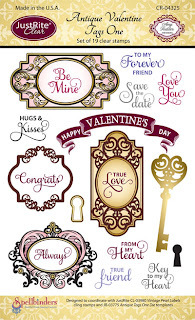 I love this set because you can use the decorative frames for tags and you can also create the look of a door lock. 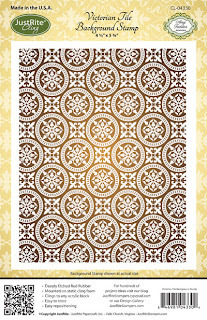 The second New Release for today is a wonderful CL-04330 Victorian Tile Background Stamp. This is such a beautiful pattern. Here is the card that I designed using both of the stamp sets. I used Toffee Crunch ink to stamp the background on to Simply Smooth Ivory paper. I used S5-131 A2 Matting Basics A and S5-132 A2 Matting Basics B to cut/emboss both of the mats. 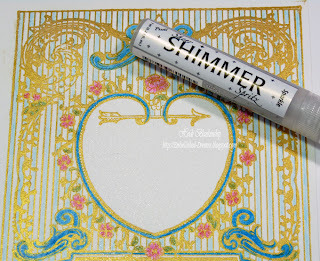 For the flourish I used Champagne Metallic paper and I applied an Adhesive Sheet to the paper before die cutting it. I used S2-006 Garden Weave die template for the flourish. You can see the shimmer of the Champagne Metallic paper in the second photo. For the sentiment and lock I stamped the lock using Desert Sand ink and for the key hole I used Toffee Crunch and then stamped the sentiment using Tuxedo Black ink. 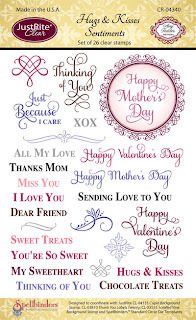 Next I used S4-356 Floral Ovals die template to cut/emboss the decorative oval. To add some dimension I used 3D Foam Squares and then for a finishing touch I added a few ivory pearls. To create the bow I used Sheer Ombre Antique Gold/Ivory ribbon from Really Reasonable Ribbon and added a key and locket charms. Thank you so much for stopping by today! Please be sure to visit all of the Designers in the link list below to see what they have designed to share with you. Hello blogging friends! Today, is Day Two of the JustRite Papercraft December New Release. 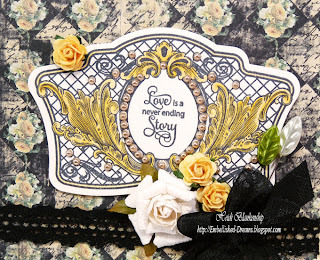 I have two stamp sets to share with you today. 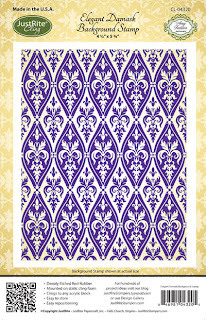 The first one is a beautiful background stamp, CL-04320 Elegant Damask Background Stamp. I love this damask pattern! 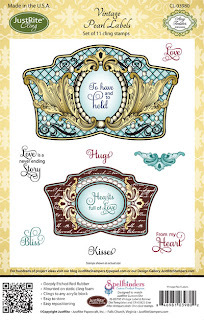 The second stamp set is CR-04340 Hugs & Kisses Sentiments. 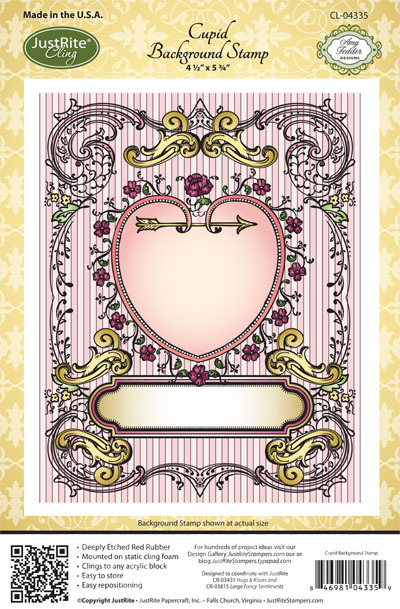 This set includes a pretty frame, accents and several sentiments that are prefect for Valentine's Day, Mother's Day and all occasions. Here is the card that I designed using the two stamp sets. 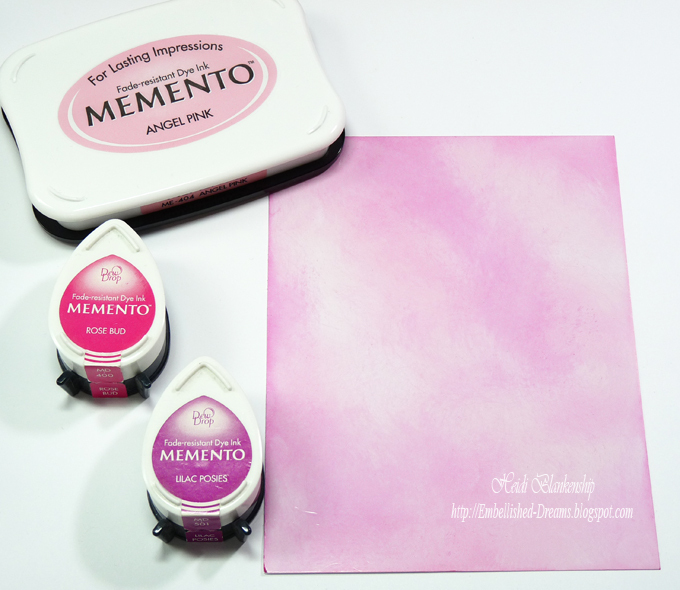 To create the background I started with a piece of White Glossy paper and added three colors of ink--Memento Angel Pink, Rose Bud, Lilac Posies working from the lightest color to the darkest color. 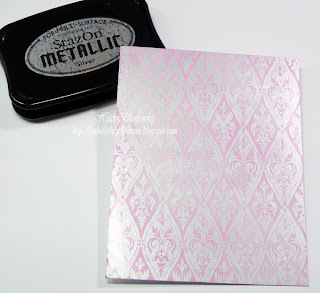 Then I stamped the CL-04320 Elegant Damask Background Stamp using StazOn Silver Metallic ink. I love how bright and shiny the metallic silver is. Here is a close up of the card. 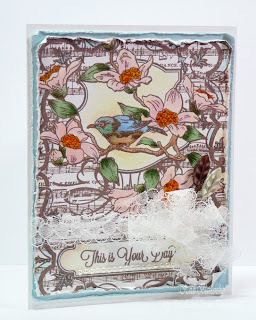 I stamped the frame and sentiment using Rose Bud and Tuxedo Black inks onto Simply Smooth White. 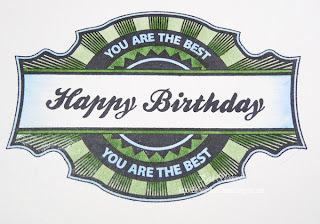 Then I used S4-114 Standard Circles Large to cut/emboss the sentiment. I also used Silver Mirror Mirri paper along with S-5 123 Asian Accents for the decorative circle. I also used S5-131 A2 Matting Basics A, S5-132 A2 Matting Basics B die templates for the matting. Then I added white lace trim, silver leaf trim, and a beautiful pink acrylic flower with a few rhinestones and a couple of stick pins. Thank you so much for stopping by today! Please be sure to visit all of the Designers in the link list below to see their beautiful projects. Hello blogging friends! We are starting a little early but today is the first day of the December New Releases for JustRite Papercraft. 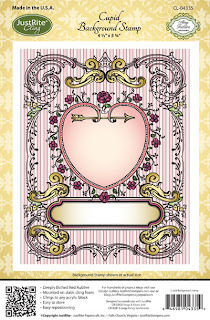 Today's release is showcasing this beautiful CL-04335 Cupid Background Stamp. This background stamp will be prefect for Valentine's Day but it would also be wonderful for weddings, anniversaries and birthdays as well. 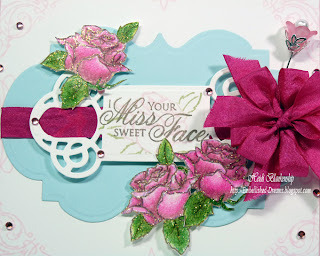 Here is the card that I designed using the New CL-04335 Cupid Background Stamp. I started by stamping the background image onto Sipmly Smooth White paper from DiscountCardstock.com using Delicata Golden Glitz ink from Imagine Crafts/Tsukineko. I set the paper aside to let the ink dry. Once the image was dry I used Prismacolor Colored Pencils to color the image. Then I lightly misted the entire piece with Pssst! Sheer Shimmer Spritz Sparkle from Imagine Crafts/Tsukineko. 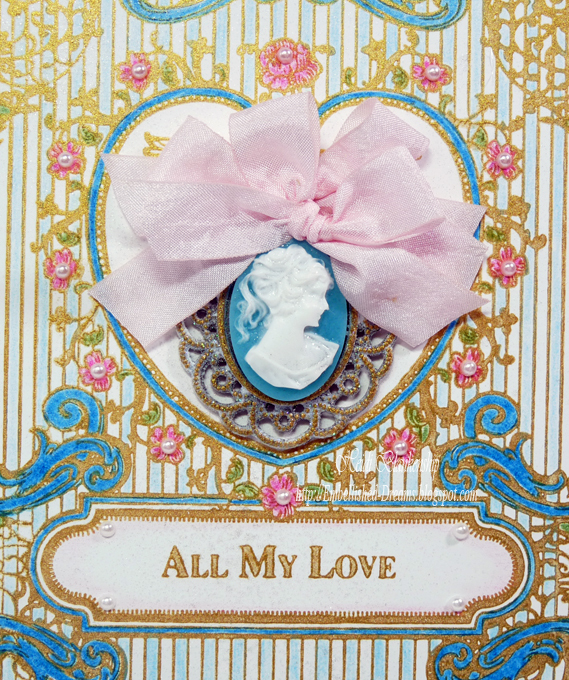 Here is a close up of the cameo I added and the Baby Pink Seam Binding from Really Reasonable Ribbon. I also added pearls and Diamond Clear Glitter from The Rubber Cafe. I used Scrap Happy Sheer Glue and the Stick "EM" Up Tool to apply the pearls and glitter. For the base of the card I used Sno Cone paper and matted it with a piece of Mountain Rose Metallic and then added the Cupid background image. Please be sure to visit each of the Design Team Members in the link list below to see the beautiful projects they have created to share with you. Hello blogging friends! A couple of weeks ago my cousin Cassie and her new husband Adam were married. They had a beautiful wedding ceremony, a wonderful reception and a great dance. 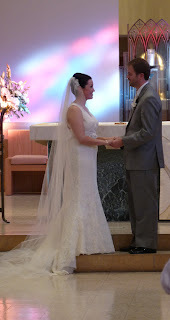 Today, I am sharing the wedding card that I made for them and for those of you who aren't on FB a couple of pictures from the wedding. 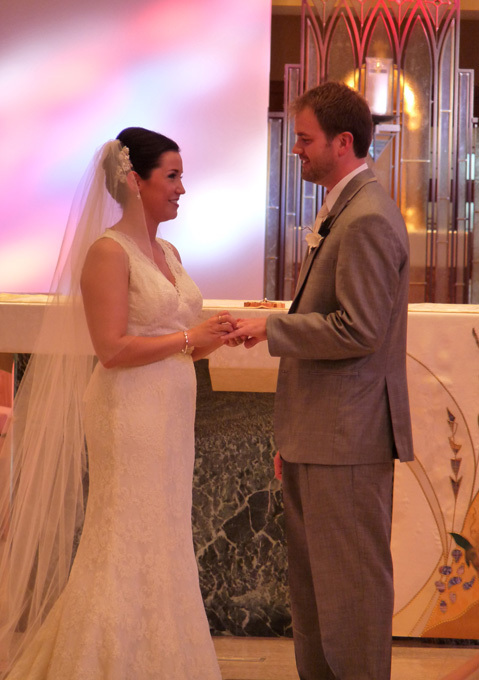 Here is the wedding card that I designed. 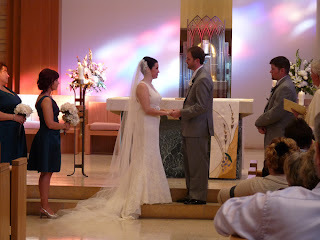 The colors/theme of the wedding was peacock feathers. Love that beautiful blue color! I used Simply Smooth White paper for the base of the card. Then I layered Gold Mirror Mirri and Simply Smooth White papers. I used S5-131 A2 Matting Basics A for the Gold Mirror Mirri and S5-132 A2 Matting Basics B and S5-152 Fancy Lattice to create the white lattice piece. Before I die cut the lattice piece I applied a piece of Adhesive Sheets to the back of the Simply Smooth White. I used S5-132 A2 Matting Basics B to make the first cut of the paper and then I used the S5-152 Fancy Lattice. 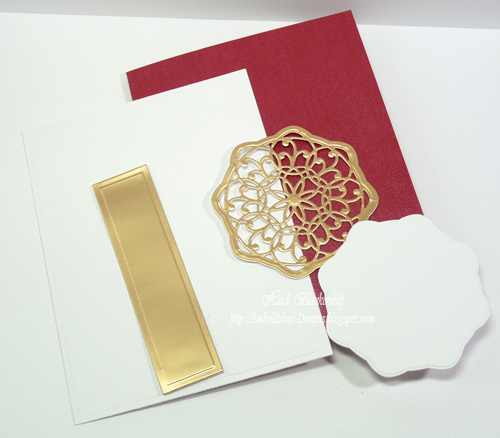 Peel of the backing of the Adhesive Sheets and apply to the Gold Mirror Mirri paper for a perfect fit. 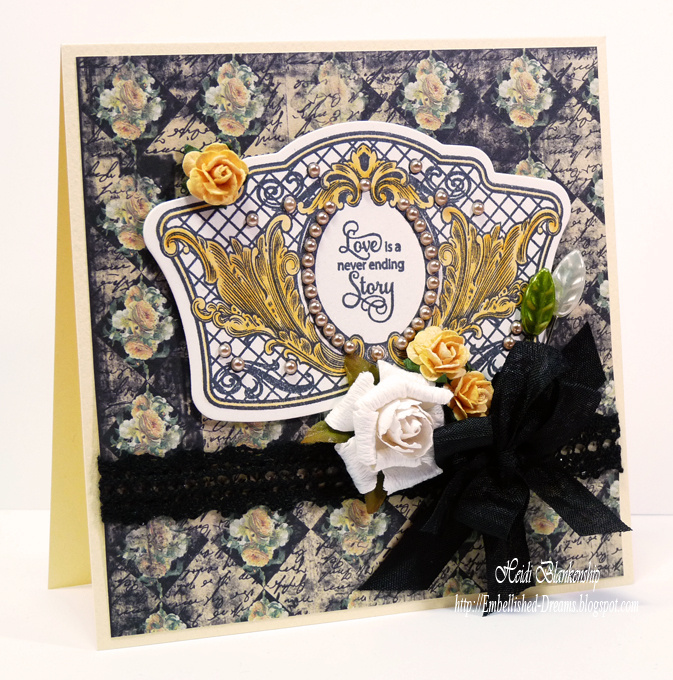 For the sentiment I used gold pigment ink and gold embossing powder with the stamps from CR-03825 Ever After Antique Labels stamp set from JustRite Papercraft. Then I used S5-148 Decorative Labels Eight to cut/emboss the shape. Before removing the paper from the die template I used Coipc Marker B04 Tahitian Blue to airbrush the inside edges of the label. I added 3D Foam Squares to the back of the label for a little dimension. I added a couple of stickpins for embellishments and then added a seam binding bow using Peacock and Dusty Olive Seam Binding from Really Reasonable Ribbon. I also added a few pearls. I used a garment pin and added a tiny pearl heart to the bow. Now for a look at the beautiful couple on their wedding day. In the church where they were married there were stained glass windows that were up at the top and they were the whole length of the church. It was the perfect time of day for the light to shine through creating the beautiful display in the background. I love her bouquet!! 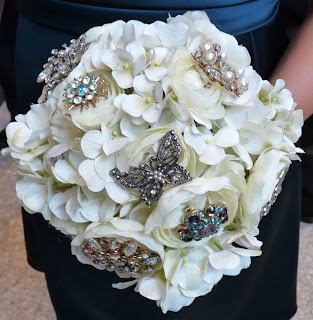 She had silk flowers and then a mix of new and antique broaches. The butterfly was in memory of Alex, Cassie's sisters little girl that passed away a few years ago. The family always has butterflies in memory of sweet little Alex. 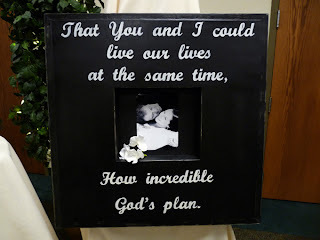 This is a picture frame that Cassie's dad made for one of their wedding presents and I painted the sentiment on the frame. One of their engagement pictures is in the frame. Thank you so much for stopping by today and for letting me share a little bit of my family with you. Hello! I hope everyone had a wonderful Thanksgiving with family and friends and lots of yummy food! Were you one of the brave Black Friday shoppers yesterday? We didn't venture out to the stores yesterday but we did do a little bit of shopping online. I like the online shopping so much better--no crowds and you get the same great deals all from the comfort of your home. 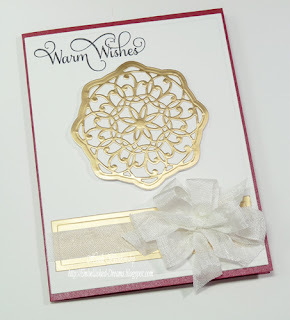 Today, I have a Christmas card to share with you using one of the new Die D-Lite die templates from Spellbinders. 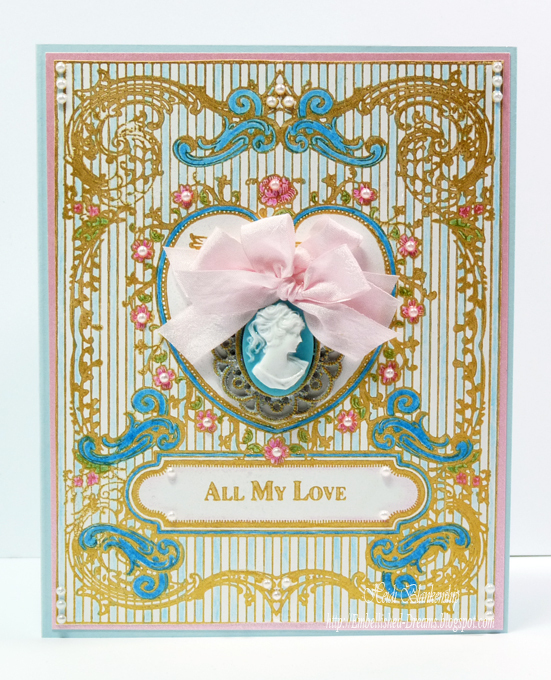 You can click HERE to check out all of the new Die D-Lite dies. Check out the beautiful details in the S2-020 Medallion Five Die D-Lites die template! 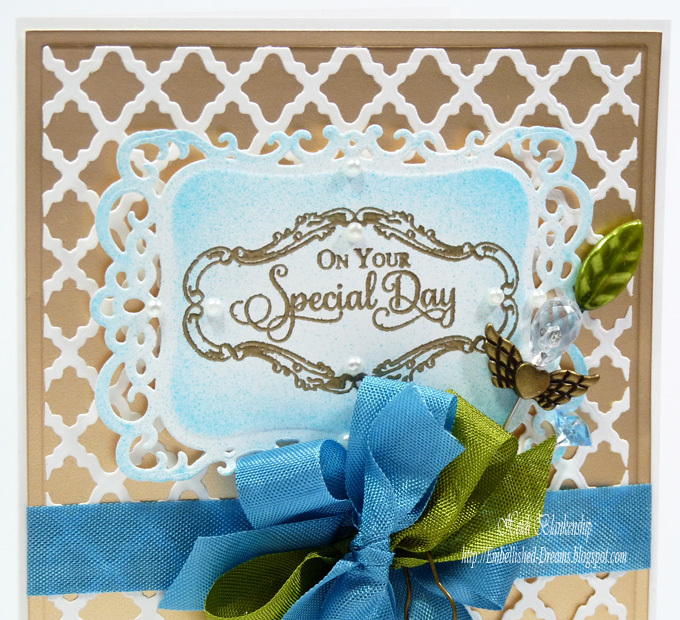 Just a little designer tip--when using very detailed die templates with intricate cut lines place a piece of wax paper in between the die template and cardstock. When doing this you will be able to remove the die cut very easily. 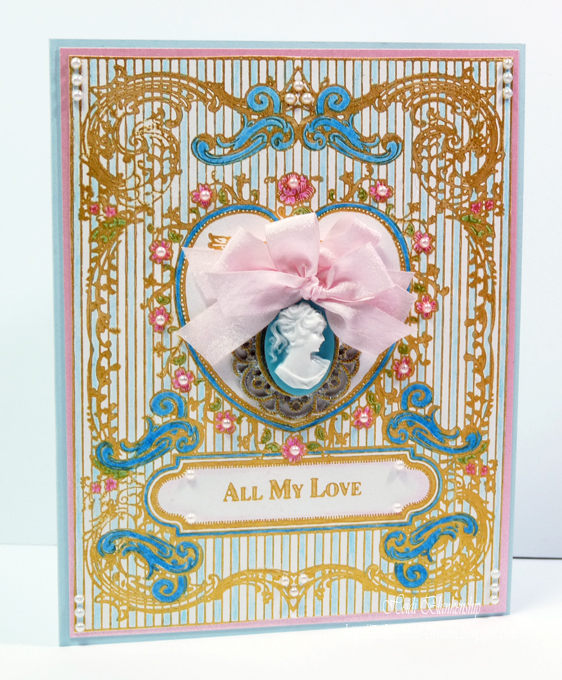 I used the S5-131 A2 Matting Basics A and S5-132 A2 Matting Basics B from the Card Creator die templates along with the S2-020 Medallion Five Die D-Lites to create all of the die cuts for the card. 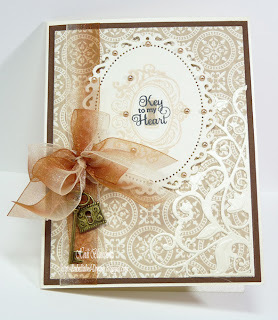 I used White 130#, Desire Metallic, Gold Mirror Mirri papers from DiscountCardstock.com. 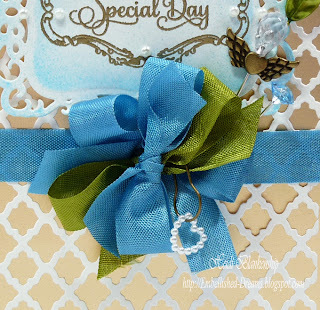 I layered all of the pieces on the card front and then I stamped the sentiment from JustRite Papercraft CR-03800 Large Fancy Holiday Sentiments. Next I added some White Seam Binding from Really Reasonable Ribbon and then to finish off the card I added some bling (as seen in the photo above). To find more inspiration please visit Spellbinders Blog. Hello blogging friends! 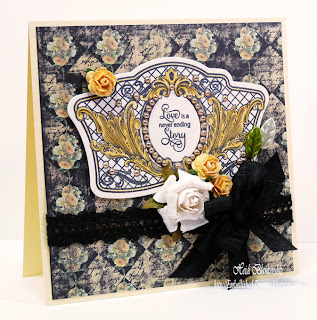 Today, I have a project to share with you using Becca's New Amazing Paper Grace Kit # 4. 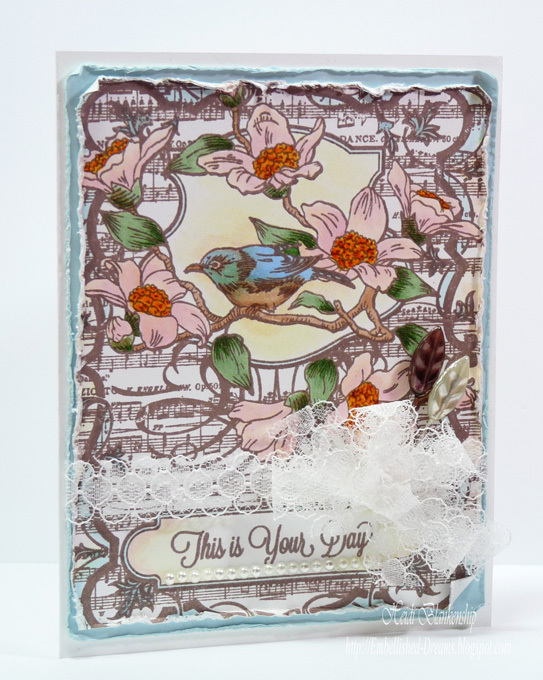 The kit is filled with all of the products you will need to make her projects and it also includes the stamp set AG-04365 What Defines Us and die template set AG-03965 Filigree Bracket Label Dies. Click HERE to find out all of the details about Becca's New Amazing Paper Grace Kit # 4. Here is the card that I designed using the stamp set and die templates from Amazing Paper Grace Kit # 4. 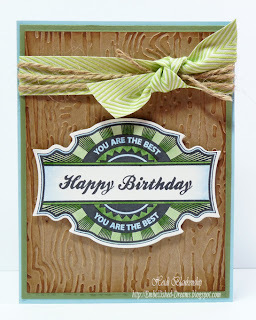 For the larger label I used Sno Cone (Lt Blue) cardstock and for the tag I used Simply Smooth White. I used Angel Pink and Pistachio Memento inks to stamp the image of the rose in the center of the tag. 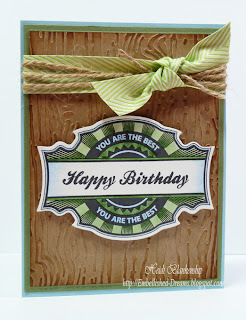 Then I used Rich Cocoa Memento ink to stamp the sentiment. I stamped the roses using the same Rich Cocoa ink and then I colored them using Prismacolor Colored Pencils and fussy cut each of the roses. I layered the pieces using 3D Foam Squares and then I added some Diamond Stickles to the roses for a little bit of sparkle. The ribbon is Fuchsia Wrinkled Ribbon from Really Reasonable Ribbon. I created a layered bow and then added a stick pin. 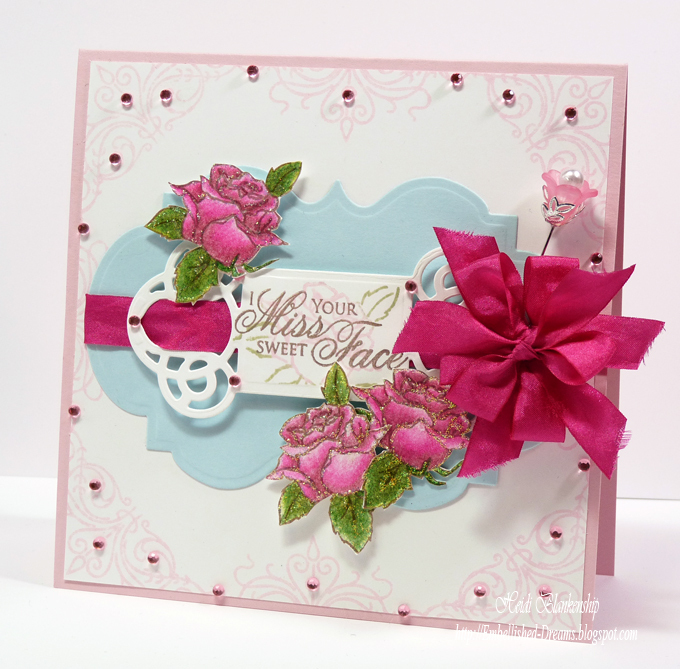 I used the larger filigree stamp along with Angel Pink Memento ink to create a border around the edge of the card. 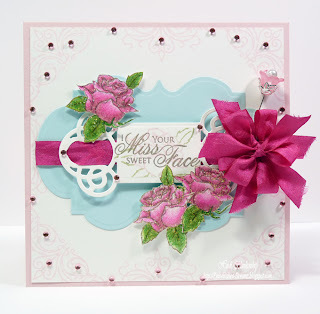 For a finishing touch I added pink bling to the tag and around the edges of the card. 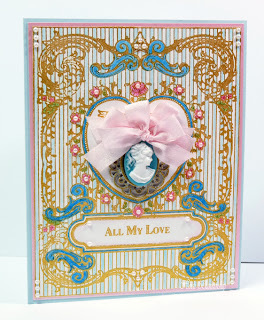 Please be sure to visit all of the JustRite Papercraft Designers in the link list below to see what they have created using Becca's New Amazing Paper Grace Kit # 4. 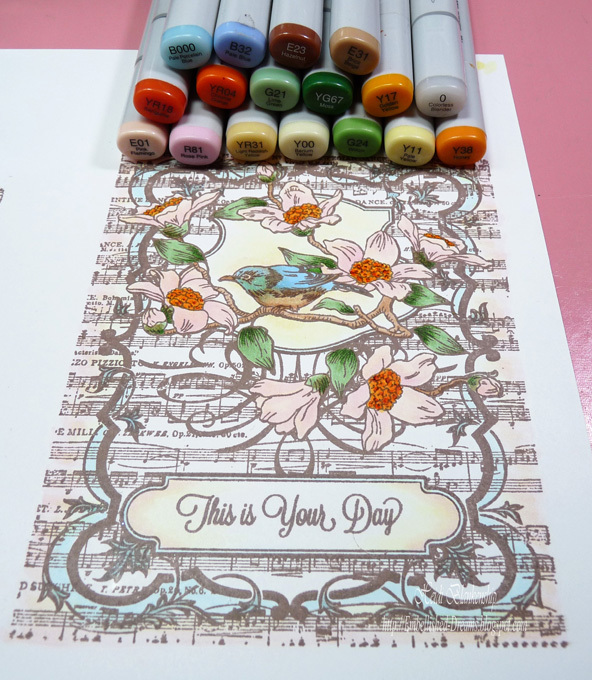 Click HERE to see artwork from Day 1 of Becca's New Release. Thank you so much for stopping by today! I hope you have a wonderful and creative day! Hello blogging friends! Today, I have another New Release from JustRite Papercraft to share with you. The new release is a beautiful CL-03970 Song Bird Background Stamp. 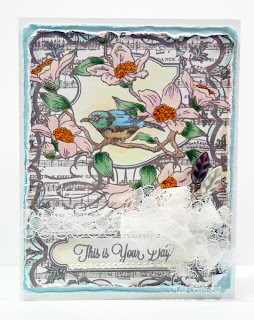 Here is the card that I designed using the CL-03970 Song Bird Background Stamp. I love this background stamp with all the layers of images. 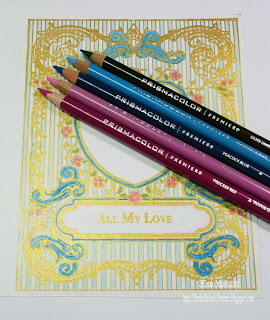 I stamped the image using Rich Cocoa ink and then I colored it using Copic markers. I cut the image slightly smaller and then distressed the edges and layered it with a piece of Sno Cone (blue) cardstock and added it to a white card front. 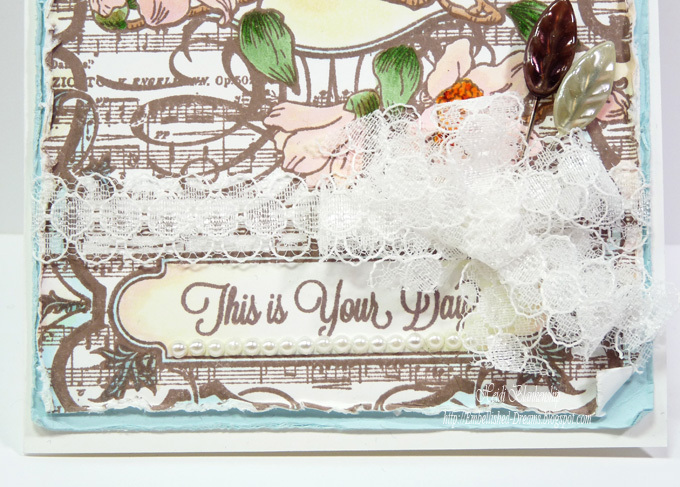 I added May Arts Ribbon Sampler DelicateVintage Lace around the bottom and created a layered bow. Then I added a couple of trinket pins and some pearls. Hello blogging friends! Today, I have one of the November New Release stamp sets from JustRite Papercraft to share with you. The new release is CR-03955 Premium Labels and this set includes several label shapes and sentiments. 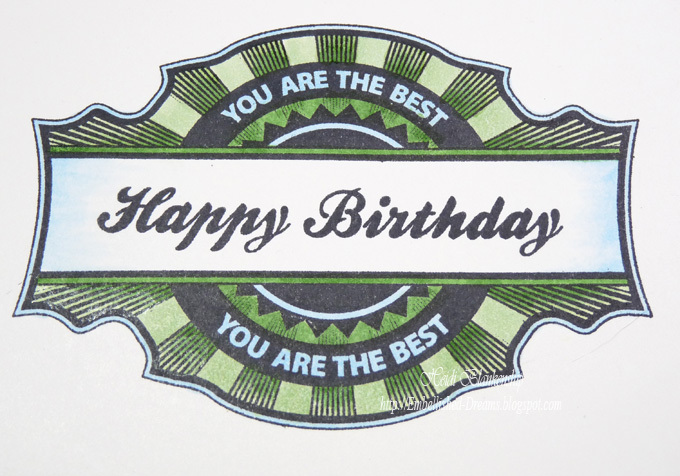 Here is the card that I designed using CR-03955 Premium Labels. 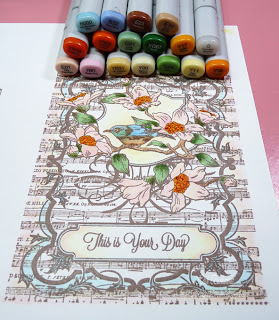 I stamped the images using Tuxedo Black ink and then I added the color using Copic markers. Here is a close up of the label image. After I had the image colored I used JB-03830 Antique Labels One Dies Custom Dies from JustRite Papercraft to cut/emboss the label shape. 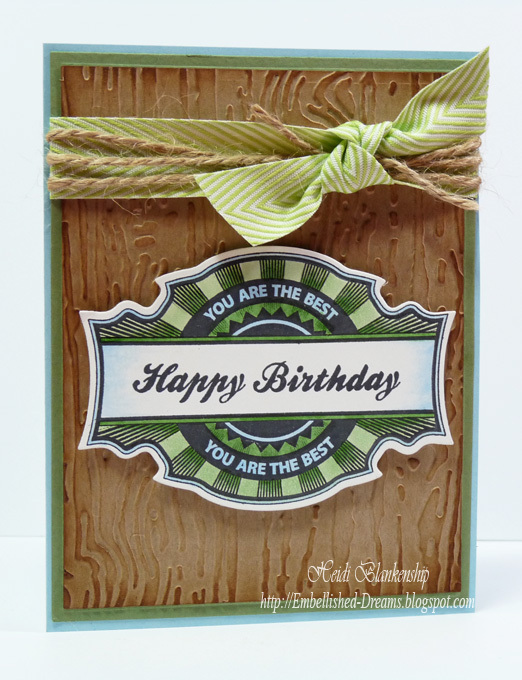 Then I used Kraft paper with El-015 Bricks and Bark M-Bossabilities and vintage photo ink to create the background. 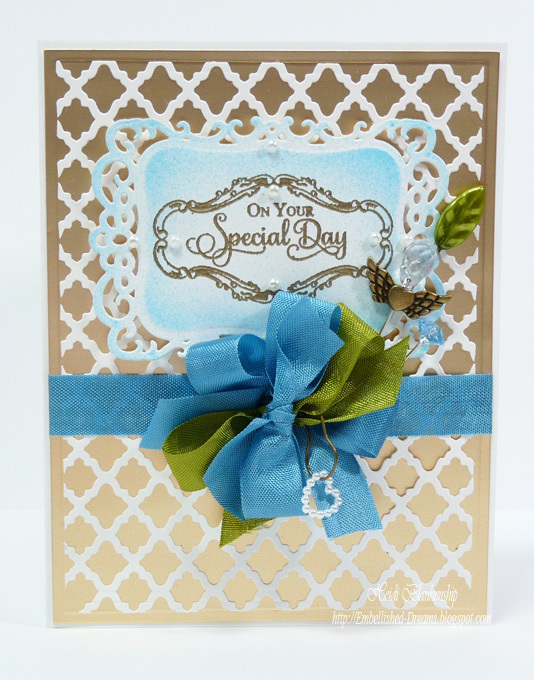 I also used S5-131 A2 Matting Basics A and S5-132 A2 Matting Basics B die templates from Spellbinders. 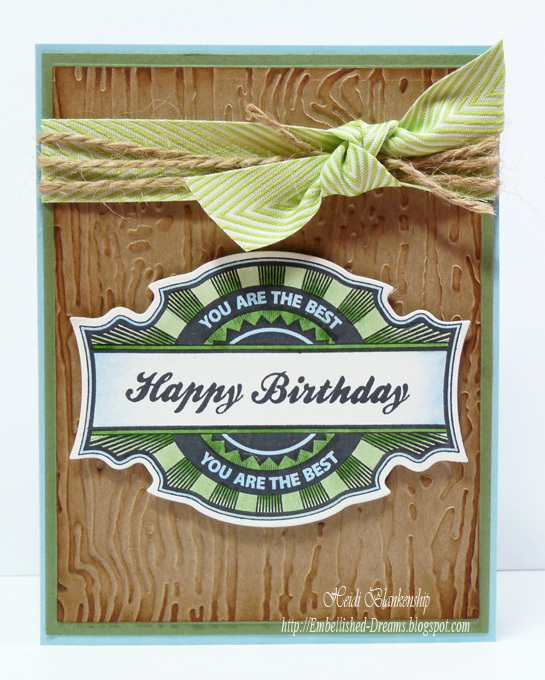 I added some Celery Chevron Twill and Natural Jute String from Really Reasonable Ribbon to the top of the card to finish it off. Please be sure to visit each of the designers in the link list below to see what they have created using the New CR-03955 Premium Labels stamp set from JustRite Papercraft.